The iPod nano Thong | OhGizmo! Seems some marketing dudes must have fallen into the same batch of stupid stew as children, and grown up with strange ideas about what sort of fashion accessories people want for their gadgets. A few months ago, we showed you the phone thong, a thong shaped case for your cellphone. 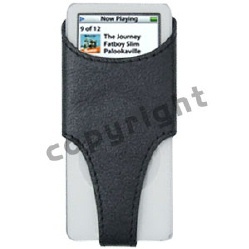 Now someone else is selling a thong shaped case for the iPod nano. Yeah, that’s right. For $35, you can carry your brand new nano around in a leather thong. I’m not… you know, I’m not going to spend another word on this. Go here and search for “thong” to get to it and buy it, if you’re so inclined. Story VIA TUAW. Totally stupid what is this for ? You canÂ´t even use the clickwheel anymore. It should be legal to kill people who invent all these crap and overpriced accessories for the ipods. Or at least legal to beat them up. Also, it conveniently exposes the corners, along with pretty much anything you might want to actually PROTECT, while preventing you from using controls. It strategically covers only PART of the screen, making it both unprotected AND useless. Yea, this looks pretty dumb and you can’t even dial the wheel with this on there.